Once upon a time in EnyaLand, the Loyal, Faithful and Devoted pined away, sighing in despair that there would ever be a sixth album released by their Celestial Fairy Princess Chanteus. They longed for the old days when elven princess-like Enya would sweep her hand across the sky and a spark of magical stars would fall onto a golden yellow beach and a little boy would realize all of his dreams in a Maxfield Parrish wonderland. They remarked upon the modest and shy singer of Orinoco Flow, the majestical young clock-managing princess on the throne of The Memory of Trees. Enya, consigned forever to be 17 going on 27, wasn't to be allowed to grow up! 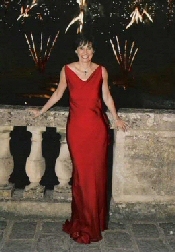 So it was with much surprise that Enya Brennan trotted out Amarantine on October 27, 2005 at a spiffy splash at a French chateau, and wore a stunning red backless evening gown to do so. The night the photos of Enya in her backless gown were released on enya.com was the Night the Dress Controversy Came to EnyaTown. And out of this controversy, one slightly bored writer-person spawned -- The Interview with the Dress! and an exclusive interview with...The Dress itself! A veritable storm of controversy surrounds the Irish singer Enya as she debuts her sixth solo recording, Amarantine. EnyaFans were shocked recently when photographs from the Paris launch party for the new recording, showing the reclusive chanteuse in a backless gown, revealed that Enya not only has a back! but also has skin! on it! This startling revelation left many fans, used to seeing the Celtic Songbird attired modestly in velvet robes and demurely cut designer gowns and suits, reeling! The Celtic Faery Tale Princess has rarely in the past been photographed with bare arms, and her hands were often shown partially covered by long, flowing sleeves. While some fans embraced the singing star’s new, daring look (“Lipgloss!” responded one Mr. Astro when asked his opinion of the earth-shattering photos), other fans were enraged. “Consign her to the flaming pits of hell!” was one comment foisted upon EnyaFandom by one rabid fan who had prepared a voodoo doll in the image of the Donegal-born singer. The Shredded Remains of said fan were discovered shortly afterward in a dank corner of Mandeley Dungeon surrounded by fluffy tuffs of orange and white fur. Other fans likened Enya’s appearance in a backless gown to the flashy excesses of skin and bad taste of Brittany Spears, Paris Hilton and Madonna. This fan was arrested shortly after for Pixel-Peeping and will be shot on Tuesday. “I think this pixel-peeping is not very respectful of Enya,” said the Renegade Policeman following the arrest. It was noted by many that it was the disapproving male members of the EnyaVerse who pulled the photographs into their photo-editing programs to… examine them closely. Women were quick to rush to the Irish star’s defense, and a lively discussion of undergarments for daring and dressy gowns ensued, as well as of beauty pageant methods to keep low-slung waistlines where they should be. “Fabric glue,” said one woman member of the group, well versed in such techniques. For further comment on The Incident, we were able to interview: The Dress itself! INTERVIEWER: Tell us about the launch party. Was Enya happy with you? DRESS: "It was a splendid party and I thought Enya looked ravishing wearing me. We both had a great time, though we wish that big blond over-stuffed Tarzan-wannabee hadn't kept hovering over us." INV: That's a new name for Enya fans. She's known for her Jasper Conran, Ciaran Sweeney and Louise Kennedy creations. So, she's adding a new designer? DRESS: She wanted a new look, something a little more daring. INV: Something that might match her latest comments about Clannad and her family? DRESS: You said it, not me. INV: Are you wash n' wear? DRESS: You gotta be kidding. INV. What do fear most? INV: Moths? They only eat wool. INV: Enya would be concerned about that, too. DRESS: You bet! One good hole eaten in me, and whooops! there goes the whole show! INV: Oh, that would be a problem! DRESS: Yep! Unclip that chain and people who complain that they haven't seen much of Enya lately have nothing to complain about anymore. INV: (chuckling) Though a lot of people are saying that anyway. DRESS: The funny thing is, it’s men who have the most problem with me. The women are high-fiving themselves all over the place and shouting “you go, girl!” to Enya. INV: Will you be going to more parties with Enya? DRESS: Oh, I hope so! If there’s one woman in the world who knows how to carry a dress like me off with style and panache, it’s Enya!